Main and College Streets (shown above) have been the heart of Oberlin since the town was founded. Oberlin is one of those small towns, that has a big heart and an even bigger soul. Founded in 1833 as an expression of independence from the establishment church of the early 1800s by disgruntled students, a minister and a missionary, Reverend John Jay Shipherd and Philo P. Stewart. Oberlin soon found itself the center of abolitionism in Ohio. This small community would eventually draw the focus of the entire country on its actions and stance on slavery. The core of the community is Oberlin College. 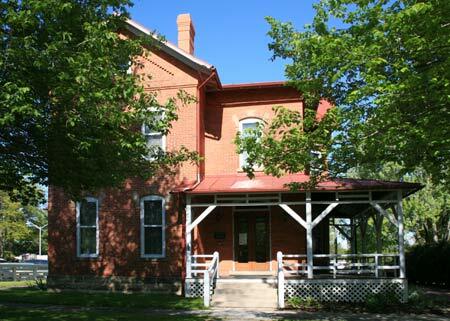 Founded as Oberlin Theological Institute, it later became a College and was the first integrated school in the state. By 1860 Oberlin had a population of just over 2,000 including over 200 African Americans, many of whom were former slaves that had found their freedom on the Underground Railroad. The college also opened its doors to women and in 1841, it became the first college to award bachelor's degrees to women in a coeducational program. Located in the newly created historical park is what has become known as "The Little Red Schoolhouse" built in 1836. It was Oberlin's first public school, where African-American and white children studied together under the same roof, even though Ohio law made this an illegal act. In 1835 the Oberlin Society appointed a committee to build a school house. After some discussion, $200 was raised for the 20'x24' building. Although the building was too small it served its purpose until a larger public school was built in 1851. Over the years the building has served as a home, a tailor shop, and several additions were made to the original structure and it was moved several times from its original location. In 1968 the old school schoolhouse was reclaimed by the Oberlin Historical and Improvement Organization and is today filled with artifacts from Ohio's 19th Century educational programs. 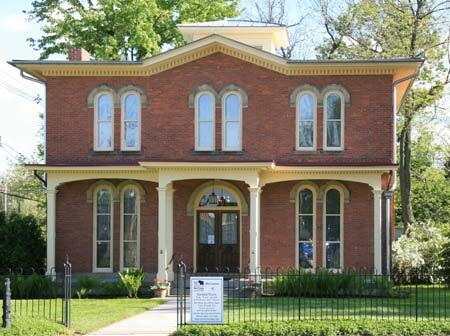 The brick Victorian-style Jewett House built in 1884 was the home of Oberlin College chemistry professor Frank Fanning Jewett, and his wife Frances Gulick Jewett, author of books on public health and hygiene. The Jewetts and the subsequent owners, the Hubbards, rented rooms to male Oberlin College students, who slept in the attic and studied on the 2nd floor. This house and its simple wood frame barn are listed on the National Register of Historic Places. Originally built by General Giles Shurtleff immediately after the end of the Civil War. James Monroe bought the house from Shurtleff in 1870 upon his return from Rio de Janeiro where he served as Abraham Lincoln's consular. Monroe served 5 terms in Congress and later taught history and political economy at Oberlin College. After his death the house fell into disrepair and abandoned until its total restoration 1983. Founded in 1917, the Allen Memorial Art Museum has one of the finest college or university collections in the United States. With more than 12,000 works of art from virtually every culture and spanning the history of art, the AMAM's collection is a vital cultural resource for the students, faculty at Oberlin, but also the surrounding community. The collection is housed in an impressive Italian Renaissance-style building designed by Cass Gilbert and named after its founder, Dr. Dudley Peter Allen (B.A. 1875), a distinguished graduate and trustee of Oberlin College. In 1977, Venturi, Scott Brown and Associates designed an addition that represents one of the earliest and finest examples of postmodern architecture in the United States. The Underground Railroad Monument was designed by Cameron Armstrong, a student at Oberlin College in 1977 as his senior art project. His class donated the monument to the school. The monument is a stretch of full-sized railroad track that protrudes from the ground at a 15-degree angle. Although the "art project" was supposed to be dismantled when he graduated, the 21 year-old Cameron advocated to let it stand. James Burrows graduated from Oberlin College in 1962. For most, his name may not be immediately recognized, but his work is immediately known. James Burrows produced such TV shows as Gary Unmarried, Will & Grace, and Cheers. He also directed countless television shows such as Friends, Caroline in the City, and Frasier. James Burrows has won 10 Primetime Emmys and over 50 nominations during his productive career. Mr. Burrows is currently lending a hand in saving Oberlin's Apollo Theater on E. College Street.